An American notices dirt. Now, some of our Midwest towns and cities are very clean, with monies going to upkeep as civic pride is an important community aspect of life. One thing I have noticed over the past twenty-five years in the deterioration of some European cities. Dublin, for example, is filthy, with dog excrement everywhere and garbage piled outside even nice shops. People smoke while walking, which was considered a no-no where I am from, and drop cigarette butts everywhere. I noticed in parts of London the same deterioration of cleanliness. This sad fact is part of the culture of individualism, which undermines a sense of belonging to a community. The idea that a street, a road, a neighbourhood belongs to you and your family and friends is gone. No one seems to care and the younger ones, who are less than thirty, probably have not seen anything else than urban dirt. To me this is an indication of the lack of communal pride and community, period. There are no young people in the churches for daily Masses, except at the Latin Mass, which creates a sub-community of sorts. 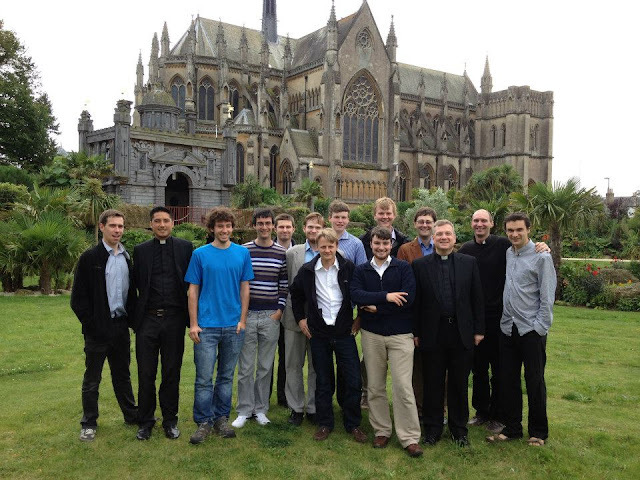 However, the only young people I have met at the TLM are all foreigners and none Irish. These young college students or young marrieds are from Singapore, Poland, France, Germany. They go to the TLM at home and go here in Dublin. But, how sad that the local youth are steeped in a rebellious spirit and reeling farther and farther away from God. 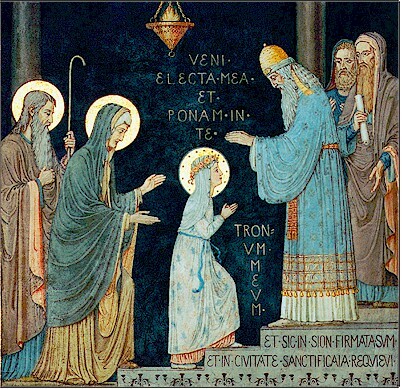 Today, on the Feast of the Presentation of Mary, I pray for her youth in Eire. May they come back to the faith soon. Mary belonged to a community, a strict bound community, with cultural rules and customs which not only gave the individual identity, but created an extended family. By the way, I asked God what my real vocation was when I was in the monastery. Too simple, but my vocation is to be Supertradmum. And, pray for priests, pray for seminarians. Bernard of Clairvaux's famous sermon on the meeting of Christ and Mary Magdalen in the Garden highlights the theme I have here and in the previous post on the Presence of Christ within us. Bernard states that Mary was looking in the wrong place. Christ was in her, with her, in her heart, and in her soul. Why was she looking for Him? The heart of Mary Magdalen was full of the love of Christ. Her heart, notes Bernard, was a garden for Him to be in with her, like the garden in the Song of Songs. There is a mystery about Christ being in us, which the new agers, in their perversion, have said loudly to the modern age. But, the Christ of the new agers is not the Christ in the Garden, the Resurrected Christ bearing the signs of His passion, the wounds in the Sacred Hands and Feet, as well as Side and Head. No. They want a Christ without suffering. Sorry. The Resurrected Christ Who comes to us when we humble ourselves and allow suffering to carve out our hearts to make room for Him, this Christ, had suffered for us, and with us, and in us. This is the scandal of God's Love for us. The Eucharist is the daily reminder of this diminishing of the power and the glory of God. I call the Eucharist the Vulnerable God. The horses of the visitants at Fountains Abbey were forced to stomp on the Eucharist, thrown from the Nine Altars. I have written many long poems on the desecration and lost Love caused by those men, who in their arrogance, wrote back to Thomas Cromwell and bragged of their duties. I am the poet of the honour of Fountains, a numinous place for me. Over and over again, the Christ in the Eucharist has been abused. We abuse Him with our selfishness and sins. But, He desires to forgive us and go even further into a love relationship which is stronger than death, as the Scripture states. So, Bernard says, look into yourselves and find Christ, find the Father, find the Holy Spirit. You will need the strength of this relationship in days to come, if not now. The Church pastors tell us to join our sufferings to Christ. This is backwards. What am learning is that Christ joins His sufferings to ours. I first had an inkling of this when I had cancer. What do I mean? The Child in the stable was cold. He did not need to come down from heaven and join into that cold, a result of Original Sin, as the Fathers tell us that Adam and Eve would not, before the Fall, experienced pain in harsh weather. But, as Joseph and Mary adored the Holy Babe, they must have been amazed at the power of God being set aside, diminished, ignored, completely made subservient to pain and suffering. 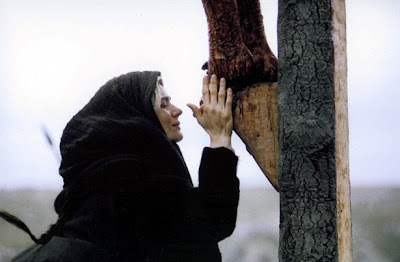 In Mel Gibson's The Passion of the Christ, there is a particular statement of Mary, the Blessed Mother, at the foot of the Cross. She states something like, and I paraphrase (apologies if out of order), "Jesuah, Bone of my bone, and Flesh of my flesh, let me die with You." At that point, Christ gives Mary to John and to us. She is the co-redemptrix and the scene indicates such. But, Christ, Who dwells in us, redeems our suffering daily. As we carry Him into the world in suffering, frustration, physical pain, He is there joining us in those results of sin. He decided to do that. We do not join with Him, He joins with us, in us, and raises us up into a relationship of love because of that joining. I am never alone in my suffering, as Christ is with me. I know this. \It is not merely my Faith which tells me this, or the great teaching of the Church, which explains my baptismal union with God in His Trinity. I know this. When one is with Christ, nothing else matters. This is why Mary wanted to die; not merely to end the nightmare of the Crucifixion which she witnessed, but to be with Christ, her beloved Son. The lay person does not need to seek crosses, as these are given and to some of us, in number. It does not matter. What matters is that we each recognize the Crucified One in our own hearts. He is there. Some of my friends, both on-line and virtual, are sad that I left the monastery. I do not want anyone to be sad if I am following God's Will, which I am, by being out in the big, bad world. I know that some of my dear friends who have known me for years want me settled and I want this as well. But, one can only do what is in the plan of God and not pretend to be something other than what one is. One cannot play God. Recently, I was reading the life of St. Benedict Labre. In the eyes of the world and indeed, even many in the Church, he was a Failure. I stand with the Failures of the world, and even the Church. Perhaps the small group of those saints called "fools" are where God has put me. I hope so...there is a long list of such people who did not fit in the world, nor did not want to fit in the world, and yet had no other place. 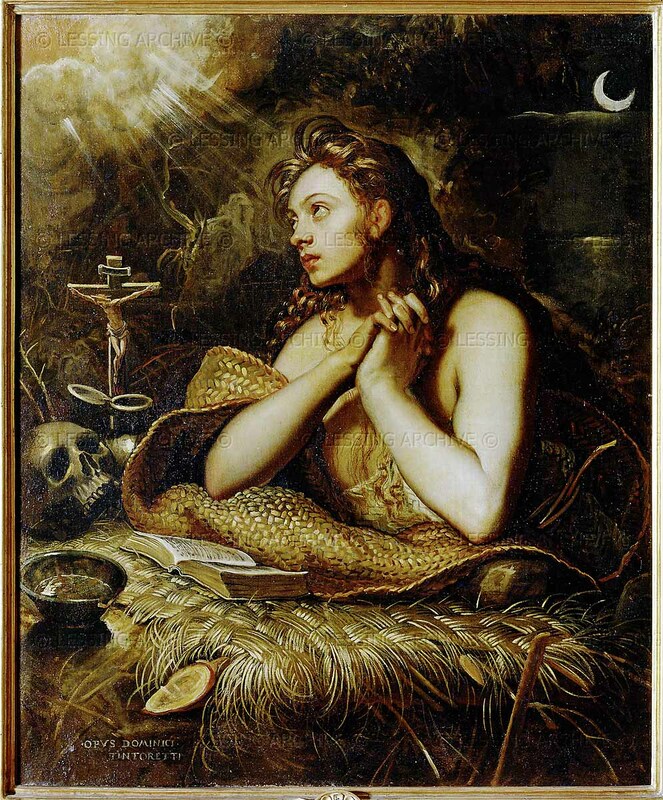 This list includes saints who were women fools, as well as the better known men. Some of the well-known men are Basil of Moscow and Theodore of Novgorod. I cannot imagine wandering about Russia. Eire is cold enough. Now, I have not chosen a peripatetic lifestyle, but here I am. I can only trust in God, in Divine Providence, as I have no one else to trust and this is the Truth of our existence anyway. Modern people, especially Americans and particularly the British, want to put people in boxes, usually by profession or by family. Now, to a point, there is nothing wrong with this. But, our real identification is neither in what we do or to whom we are related. Our identification is only is who we are, sons and daughters of God. We, the baptized, are heirs of heaven. We cannot forget that. We sin daily. We cannot forget that. We fail each other and ourselves. But, there is a God Who orders our ways, be as illogical as these may seem. The illogicality is suffering. "The foxes have holes, and the birds of the air nests: but the son of man hath not where to lay his head". Matthew 8:20. Brethren: We have been made a spectacle to the world, and to angels, and to men. We are fools for Christ, but you are wise in Christ! We are weak, but you are strong! You are honored, but we are without honor! To this very hour we hunger and thirst, and we are naked and buffeted, and have no fixed abode. And we toil, working with our own hands. We are reviled and we bless, we are persecuted and we bear with it, we are maligned and we entreat, we have become as the refuse of this world, the offscouring of all, even until now! I write these things not to put you to shame, but to admonish you as my dearest children, in Christ Jesus our Lord. At that time, Jesus said to His disciples, "Do not be afraid, little flock, for it has pleased your Father to give you the kingdom. Sell what you have and give alms. Make for yourselves purses that do not grow old, a treasure unfailing in heaven, where neither thief draws near nor moth destroys. For where your treasure is, there also will your heart be." S. By the words of the Gospel may our sins be blotted out.